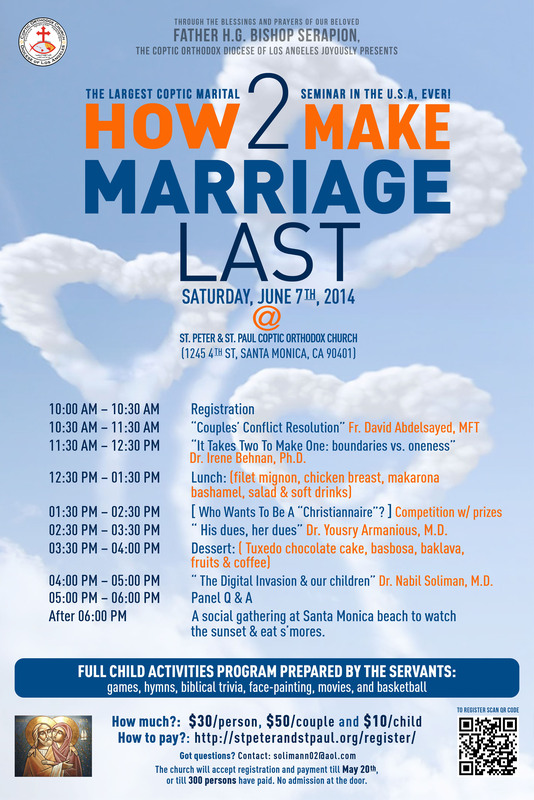 The 11th Marital Enrichment Seminar is coming back to St. Peter and St. Paul Coptic Orthodox Church in Santa Monica on Saturday, June 7, 2014. Participants who come to the seminar expect relevant topics, professional speakers, delicious food, homemade dessert, lively and hilarious entertainment, and a complete and exciting children’s program. The spots fill up fast as the church will accept applications until May 20 or until 300 persons have applied (whichever happens earlier). If you want to protect and enhance your marriage, do not procrastinate, take action!